It’s nice to know that years of driving fast cars hasn’t numbed Hennessey to the raw experience. They say you never know just how fortunate you are in life until you’re about to lose it all to that conniving grim reaper. It’s sad really, all the material possessions we can think of and if we’re lucky, fellow humans in our lives who we care about and enjoy spending time with us. All of that taken for granted in our lives, despite our liberty, and for the pursuit of happiness. But there’s a solution we think you’ll like, mainly because it involves a lot of horsepower. The words “Lamborghini,” “twin-turbo,” and "John Hennessey” come into play too. Combined in Hennessey’s alchemy lab, these ingredients can create dangerous speeds. More than enough in fact, to scare you within an inch of death and teach you to appreciate the small things in life that love you and aren’t looking to kill you on most days. Or, if that whole pursuit of happiness thing is more appealing, at least Hennessey’s Lamborghini Huracan will help you pursue faster. With turbos whistling and failing miserably at muting the 5.2-liter V10 engine, Hennessey rockets around his own race track with 1,000 horsepower going to all four wheels. 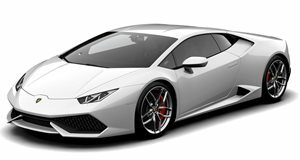 The nice thing about the Lamborghini’s engine is that nothing really needs to be changed in order for its internals to handle the boost and performance. Much of the software and auxiliary hardware needed to be beefed up, but even those changes seem relatively minor when considering the original Bugatti Veyron needed 10 radiators to successfully make the same amount of power.